That may be one of the coolest TMNT related things I've seen yet. I love the gesture with the left hand! I'll have to follow what happens with this one! I'm impressed also, & I want this so bad! I am dissapointed like you though Pete, can't they atleast put a little articulation on him? And what in the world is the deal with NECA? From what I'm being told things keep going back and forth with them, first series 2 is going to come out and now it's not, I'm so confused and agrivated about that. This needs to be produced. -->> Most beautiful thing to come out of Playmates in a long time . Looks awesome! I definitely want one of those. I hope they get made. WOW i already am reserving some money aside for this thing. Shiny robot here i come!!! will he come with any extras? WOW!! I really hope this is produced. This is great!!!!!!! i hope it gets produced. i will definetly buy at least a couple of these!!! that is absolutely beautiful...question though, do you think the fact it's non-articulated would make it brittle? 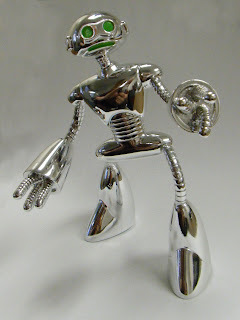 With so many vac-metal C-3Po figures I don't see why it shouldn't be possible with Fugitoid. Generally not a fan of Vac-metal stuff. It tends to look like cheap plastic rather than actual metal. But this actually looks pretty cool. I'm not surprised that Playmates won't articulate him, though. It sort of reminds me of the 5th Anniversary Leo figure I have sitting on my shelf. This might make a nice companion to him if it ever comes out. This does indeed look awesome, a rare score for Playmate's these days, even if they're not going to articulate. I'm only worried about the use of the word promotion. I hope I don't have to buy like a dozen of Playmate's mostly lousy new figures to collect codes for this like I did to get a couple Bigfoots. I shudder to think about how much money I spent on Extreme Sports Mikeys & Surveillance Dons since that was all that was left warming pegs at Wal-Mart. 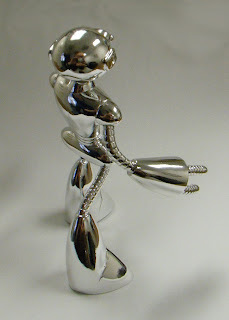 But I'll do what I have to, cuz man one of those will look good on my desk! A thing of beauty! It's ok if it doesn't move, fingerprints would ruin the finish anyway. So cool, I'd buy it! Mister Laird, this would have to be the most exciting TMNT news I've seen in the last year. Color me impressed and please make sure that it is made. I would love to own this. 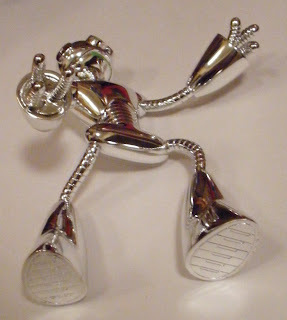 I can has vac-metal Fugitoid? But seriously, that looks great. 'Bout time, Playmates. Looks fantastic. I would seriously like to get my hands on one of these. Perhaps it's time the fans are listened to eh? Anyway do fan polls see who the top favorites are do at least one in each wave and you will find that the negativity and whining will go down greatly. Holy flerking shnit! Tell Playmates I'll take three o' 'em! Seriously, I know you've been waiting for this for a long time now, Mr. Laird, and we fans have as well. I'm looking forward to the possibility of this being released. I think I just fell in love all over again! That is really cool, I think I'd have to get it to put next to my NECA figures. Playmates ! PLEASE PLEASE PLEASE release this figure !!! Sweet. No wonder it feels so familar like the 2k3 version but I wasn't too sure it is the exact same version. Too bad it's not articulated. But ya I think Playmates did a good job with the early series of the 2K3 figures, from the TMNT,April,Shredder up till Triceriton, Fututoid, and Nanobot,etc. They really captured the art of the show as well as transforming them into some cool toys. Articulation!!! Articulation!! Pretty please!! 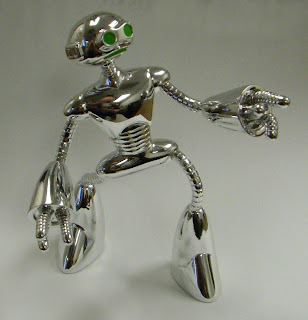 At least, in the head and arms, so he can strike a mean robotic pose! !